An attractive, dark blue jasper dip clock. This piece is impressed 'WEDGWOOD' to the base and it dates from c.1860. The clock mechanism is a replacement. This is German made and it appears to be in working order. 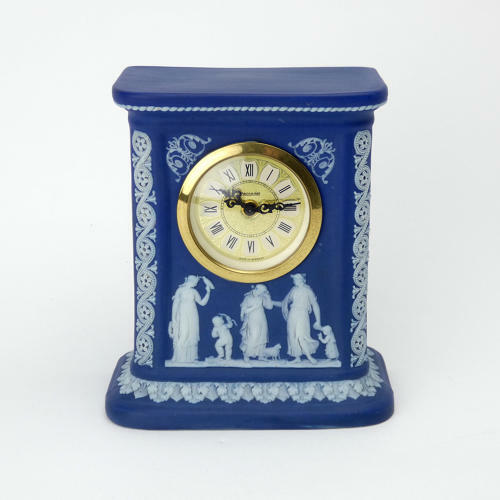 The Wedgwood clock case is very well decorated. There are classical figures under the clock face, and also to the sides and there are very finely detailed borders which decorate the side pillars. The reliefs are all good quality, the jasper dip is a good, rich shade of blue and the overall affect is very pleasing. It is in excellent condition.